Apologies if this issue has already been addressed. I searched but could not find anything. I have this warning light in the upper light cluster to the far right. It consists of an underscore line with three wavey lines and arrowheads pointing upwards. Every now and again it comes on. Is it something to do with a diesel heater that assists the cabin heating and alerts you that fuel is being consumed? Or something else that's not working properly? This light is only used for DIESEL ENGINE powered vehicles. Vehicles equipped with the diesel engine are equipped with a supplemental cabin heater. This cabin heater is mounted under the vehicle and operates similar to an oil fired furnace. The heater burns small amounts of fuel to provide additional heat to the coolant. Coolant is routed from the engine, to the supplemental cabin heater and then to the front heater core. 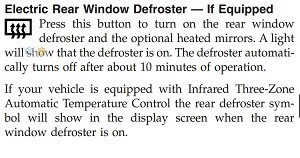 This provides additional heat to the passenger compartment. The supplemental cabin heater system is interfaced to the vehicles on-board computer systems and the scantool diagnostics. The supplemental cabin heater has an electronic control module that monitors the heat output of the heater. The cabin heater operates at full load (5 kW), half load or idle mode (no additional heat) depending on engine coolant temperature. When ambient temperatures are lower than 15° C (60° F), the supplemental cabin heater automatically operates once each ignition cycle for five minutes. This assures a good fuel supply is always present for the supplemental cabin heater. Search button / show posts / enter the word "wavy" it finds dozens or even hundreds of posts all of which relate to the aux-heater and its associated 'wavy line' icon. It's working properly, that's the warning light indicating that the unit is functioning at that point. Glad you gave its location (the three wavy yellow lines). On mine there are three of these, not underscored, but in bottom centre of dash. Also have been called three "snakes". I was assured these were to do with the rear window defogger/demister. But apparently, the three snakes for the cabin heater are very similar -- so I'm still slightly confused myself. Leedsman, the 3 lines which are NOT underscored and in the bottom centre of the instrument display are for the rear window heater, the 3 lines which are undescored to the right of the instrument display are for the auxillary heater. My previous Grand Voyager, a 2004 2.5 TD, didn't have the 3 wavy undescored lines but it did have an auxillary heater. The underscored three lines on the RHS of the information bar is the aux heater and the three lines in a box is the rear window [defogger to our American cousins] dimister. violet/yellow wire on the back of the stereo.